Rachel Kimminau provides technical product and sales support to zoos, aquariums, veterinarians, private exotic animal owners, the Purina retail sales team, and Purina feed dealers. Her territory covers the South Central United States. Rachel obtained her bachelor’s degree from Kansas State University in biology. 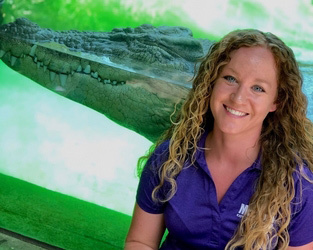 Her previous animal care experience includes zoo keeping, undergraduate research assistant in fish ecology, and working at KSU Veterinary Medical Teaching Hospital. After college, she interned at Walt Disney World where she was then hired onto the Animal Nutrition Center team at Disney’s Animal Kingdom. There she assisted in diet preparation for Disney’s entire collection of animals. Her passion and experience support MAZURI®’s passion for animals that make us who we are.